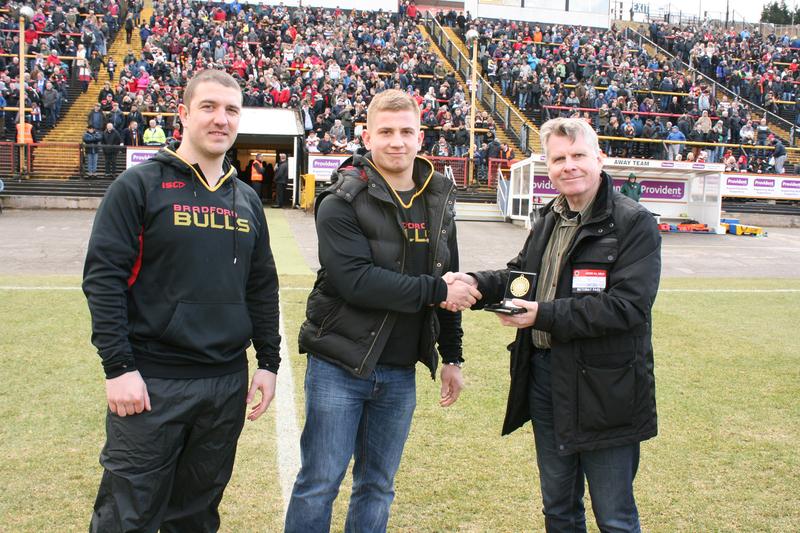 Matty Stableford, the Bulls’ Under-19 second-row forward, was the winner of the inaugural BullBuilder Player of the Month award for February. He was presented with his medal by BullBuilder chairman, Mike Farren at half-time during the first team’s game against Hunslet. Mike Farren explained, “BullBuilder, the club’s Supporters’ Trust, has invested heavily in resources for young players, with recent grants for a trailer for ground maintenance, a printer, a video camera and team building events. More will follow, but we also felt it was important to feed back to the young players the extent to which the fans are behind them and appreciate their efforts on the pitch. A Player of the Month award seemed like the ideal way to acknowledge this.” The award is judged by Under-19s coach Matt Diskin and is based not just on playing form, but also on a number of criteria relating to positive values and behaviours. As Bulls’ Head of Youth, John Bastian put it, “Matty is a good professional. He works hard and sets a good example to the younger players in the squad.” The award will be presented every month during the season, with an overall 2015 prize, which it is hoped will form part of the Bulls’ end of season awards. Matty said, “I’m very proud to be the first winner of the player of the month. Meanwhile, BullBuilder has started a new scheme, open to members and non-members alike. We would like you to pledge to make a donation to BullBuilder to the tune of 5p per point scored during the first phase of Academy Championship matches by the Bulls’ Under-19 team! As a guideline, in the opening four matches (up to and including the game against Leeds Rhinos), the Bulls have scored a total of 52 points, and there are 8 more matches to go. However, this isn’t just a sponsorship request: there will be a prize of 25% of the pot for the person whose guess is nearest the mark (if there is a tie, the prize money will be shared). To register your involvement, please send your name and your guess for how many points will be scored in the 12 league games to info@bullbuilder.co.uk, or write to Bradford Rugby League Supporters Society Ltd, Suite 2 Buttershaw Works, Buttershaw Lane, Bradford, BD6 2DD. You have until the end of March 2015 to register your guess and be eligible for the award. We will update the total on our website http://www.bullbuilder.co.uk/. We hope this will be a fun way for supporters to feel even more involved with the Under-19 squad’s matches, while encouraging the lads to keep rattling up the points, in the knowledge that they the donations they generate will all be used to support junior rugby at the club. If you want to help shape the future of the club, you can join or re-join BullBuilder by visiting our website at http://www.bullbuilder.co.uk/join/. For more information, please Email us at info@bullbuilder.co.uk or write to us at Bradford Rugby League Supporters Society Ltd, Suite 2 Buttershaw Works, Buttershaw Lane, Bradford, BD6 2DD.